In Spanish – at least the Mexican Spanish that I speak – there are three words to describe three distinct types of cramps. “Cólico” is the namesake for menstrual pain. Not particularly sharp, not dull either, but painful enough to make you curl up into a ball and, in its extreme form, make you cry. It hits the lower abdominal region, and can extend to the upper abdomen and the lower back. “Retortijón” is on a similar plane to a colic cramp, except it usually refers to that feeling you get when your bowels are twisting inside out and you have to sprint to the bathroom. It can also describe a stomach ache, or any extremely unpleasant feeling in your insides. In English, all three of these are simply “cramps,” yet they neatly sum up the post-op experience of my hysterectomy. At least that’s the short version of it. The day before my hysto, I was instructed to follow a strict clear-liquid diet. In medical-speak, this is called a bowel prep: no solid food for 24 hours. Your body can only receive sustenance in the form of apple juice, seltzer water, ginger ale, jello, gatorade, and chicken broth. Thankfully my surgeon opted me out of a laxative regime as long as I played by the rules. By 2pm I was hungry and very grumpy. At 6am on Thursday Jan 17 2013 the alarm went off. I was hungry, and thirsty, and – as always – nervous. We got to the hospital a bit after 7am, and I almost passed out when the nurse inserted my IV (signs of things to come). By 9:25am I was sound asleep in the OR. A few hours later I awoke in the OR recovery room, half-conscious and in searing pain. The doctor came by to say everything went smoothly as the nurses scrambled to pump me with meds. By 5pm it was ordered I had to stay the night. I know my body, and I knew I just had to get through the first 24 hours. In this surreal, trance-like fog of narcotics, nausea, and pain, all I could to was sleep in order to escape. My sleep was interrupted every hour as I started to wriggle around with pain and nausea. Even peeing hurts for the first day or so. It sounds hellish, and it kind of was, but at least the narcotics kept me semi-dazed. Friday morning I finally had a few sips of water, and the pain began to subside. By noon I ate Corn Flakes, the first solid food in over 2 days, a sure sign that I was ready to leave. At home I took a long nap, had a combo chicken broth with painkillers, and sat down for a long TV marathon. Things were looking up. I dreamt of all the solid and delicious food I was going to eat once my digestive tract was restored to its previous healthy condition. By Saturday I was feeling loads better. I even showered! The major discomfort at this point was experiencing runner’s cramps in my shoulder and abdomen. In a laparascopy, they fill you up with CO2 to make room for the surgeon to see your insides, and I figure the gas kind of travels around. My whole belly was inflated, swollen and tender. I spent the rest of the day listening to rumbling noises as my insides became accustomed to their new configuration. Every day brings about an exponential improvement. I walked around like grandpa, slowly and cautiously, which served as a great excuse to continue to wear sweatpants all day. Oscillating between all three types of cramps, though not nearly as debilitating as on the first day, some painkillers and couch time was all I needed. I could feel stuff moving around in there, every time I got up or lay down or ate. But by now the discomfort as no longer as severe to qualify as pain. By Monday I thought I’d be ready for work (since my job involves actively staring at a computer screen, I can do it at home) but I was still very out of it. It’s surprisingly hard to focus on anything more than an email when you are taking narcotics. At this point, the pain was minimal to none; more like annoying discomfort accompanied by a strange curiosity to find out how many different rumbling sounds my belly can produce. It’s an orchestra in there! I am in awe of the wonders of digestion. A friend came over and we baked banana bread, with chocolate chips of course! A bit more rest, relaxation, and solid, oh gloriously solid food, are the best medicine. Tuesday I didn’t even take a nap, and felt almost back to normal (apart from the occasional rumbling). Not to mention I left the house for dinner, and put on jeans and shoes like a decent human. It’s amazing what modern medicine can do. As always, I leave you with the requisite photo. 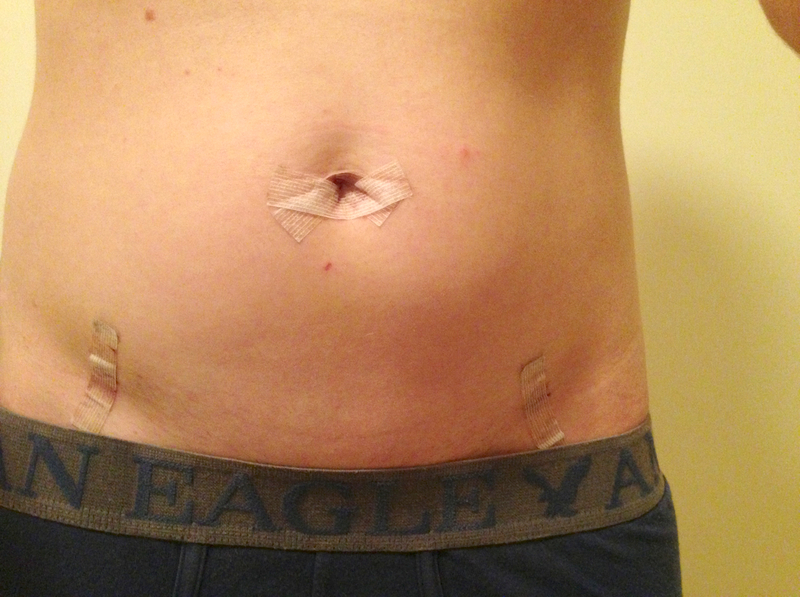 Hysterectomy Scars – so so tiny! By the time this is published on Thursday, exactly one week after major surgery, I’ll be on a cab across town for my post-op checkup, not looking or feeling significantly different than a week prior. Let the Couch Potato Countdown begin! I’m glad it went so well (except the 24 vomit of course). Best wishes on your post op visit! Quick update: Just got back from my post-op appointment. Everything’s looking great, and I already feel back to normal. It’s hard to believe I had major surgery only one week ago. Thanks for sharing this experience. I am saving so much information from you, Eli, and others for when my son makes this journey himself. You guys put my mind at ease and give my son hope and excitement. Thanks for the encouragement. Sometimes it’s hard to commit to putting myself out there, literally half-naked, for the world to see. It’s nice to be reminded of why I do it. You're a super swell person for documenting this, though. You may or may not know how much this changed my perspective on my own gender stuff, but suffice to say it's making me feel super empowered and excited that I get to to this too someday. Thanks, this is good to hear. Feel free to email me if you ever need to. So how did you get a surgeon to do a hysterectomy for you? Did you just find one who would do one on someone who’s never had children or one who was supportive of trans* people or did you have to get a letter from a therapist or something? I guess what I’m asking is, if I were to try to get a hysterectomy myself, where should I start? I’m doing a series of informational articles on this. I started by looking for a trans-friendly gynecologist in my area – I asked around listserves, friends, doctors, etc to see if anyone knew of a doctor. Ok, cool. That sounds like a good starting point, and I look forward to those articles. I think my biggest concern personally is that I live in the south and I feel like that may mean that finding a willing doctor will be more difficult. Amazing that you are up and about so fast. I had a hysto about 5 years ago for major fibroids and bleeding (yuck). Being a typical butch I had neither gone to a gyn nor paid attention to the signs of anemia until it was way late. It is great to never have a period (I sort of still have a peri-menopausal cycle but being a typical butch I ignore it). I wish I had done it way earlier. Good for you for having the courage to demand the medical procedures you need. I had also never been to the gyno. My first and only time, at 26 years old, was at a trans-friendly clinic, and it is definitely something I would’ve kept neglecting. This is one of the reasons I chose to go through surgery now.